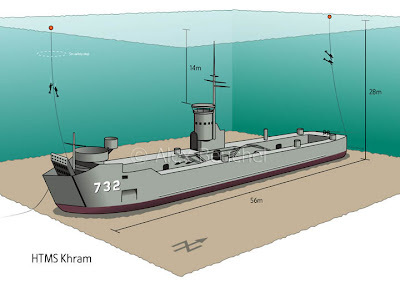 Yesterday it was in the bag after two days of wreck diving the HTMS Khraam in Pattaya, pictured below. It was the second trip this year and the fourth time in total that I was able to organize this trip. We dived three times on the HTMS Khraam, which gave my three students, Bruno, Craig and Olivier plenty of opportunity to familiarize themselves with the wreck and hence, the third dive of the series was the most relaxed and enjoyable dive which generated most pictures. How colorful it can be inside shows this picture of some bright purple fan, however, without the flash on the camera it looks rather drab at the depth we went to, around 25 to 20 meters in average. Visibility in Pattaya is not always that great but it adds to the experience and gives an additional challenge on these otherwise rather easy diveable wrecks in the area. All wrecks cater as home to plenty of undersea live, including lots of scorpion fish, as this profile shot of one of them shows. The one non wreck dive we did was also very enjoyable and during the Aware Fish ID dive we encountered this lovely cuttle fish. We completed more specialties besides the wreck diving specialty, also Underwater Naturalist was completed and we used Nitrox on a few dives. During the ascent, hanging out during the safety stop. At 12, 9 and 5 meters we had safety stops to off gas nitrogen in our bodies. A great way to spend the weekend and I'm looking forward to the next trip. Thanks guys for embarking on this adventure.